Frey Florist is a full service, family-owned and operated, flower shop in the heart of Providence's Smith Hill. 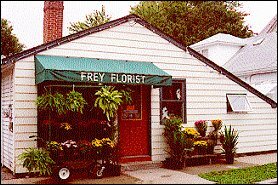 A quaint wood building with attached greenhouse, Frey Florist has flourished in a residential neighborhood since the early 1900's. All our arrangements are created by professional floral designers, each with over 20 years experience. We are members of the Society of American Florist (SAF) and Teleflora wire service which provide us with a worldwide delivery network. Frey Florist is dedicated to providing fresh, long lasting flowers tastefully arranged and delivered at a reasonable price. 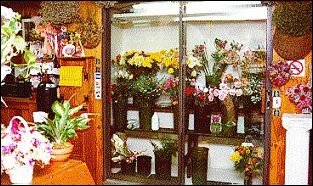 Richard Espeut has owned and operated Frey Florist since 1973. As an ecologically aware "green" florist we never treat our flowers with chemicals; we use biodegradable tissue and paper wrapping, reusable glass, wicker, and ceramic containers. We make deliveries to area hospitals including Women & Infants, Jane Brown, RI Hospital, and Roger Williams Medical Center. Our shop is within walking distance to Providence College and we offer free delivery to the campus. We are very close to RI College, Johnson & Wales University, Brown University, and RI School of Design (RISD). The renaissance City of Providence, including the new Providence Place Mall, The Westin and Biltmore hotels, and the Providence Convention Center is less than two miles from our shop. We hope you enjoy your online shopping experience with secure, 24-hour ordering right at your fingertips. If desired, you may also call us to place orders direct at (401) 521-3539 or (800) 551-0965. Wedding & Special Event Flowers ~ With Frey Florist creating the bouquets and arrangements, your wedding or special event is sure to be a “blooming success!” Call us in advance at (401) 521-3539 and schedule a consultation with one of our talented floral experts. All Occasion Gifts ~ Browse our assortment of Dish Gardens, Green and Blooming Plants for a gift that brings life to any room or office. We offer a nice selection of Baby Gifts, Candy/Chocolate, Gifts, Greeting Cards, Home Décor, Scented Candles, Silk/Artificial Flowers, Stuffed Animals, Tropical/Exotic Flowers and more! Thank you for visiting our website with flowers delivered fresh from your local Providence, RI florist and convenient online ordering 24 hours a day! !